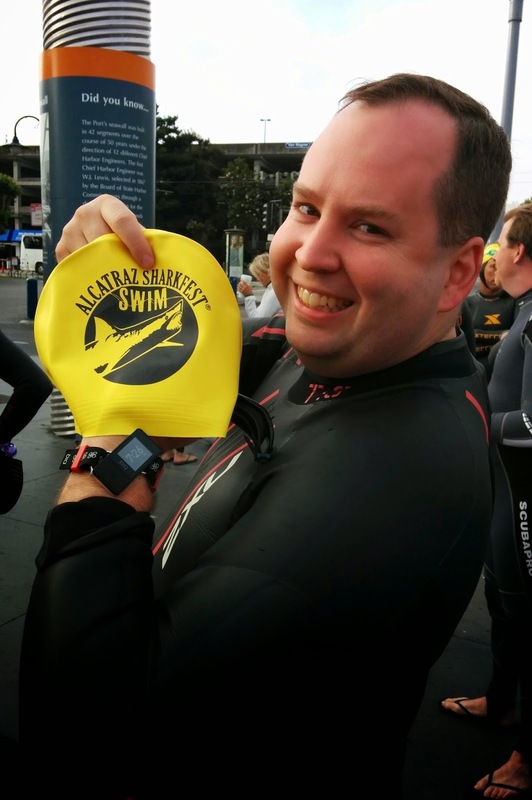 No, I did not swim from Alcatraz to SF this past weekend - but my friend Mike did! I think I finally understand how people feel when they think runners are crazy. 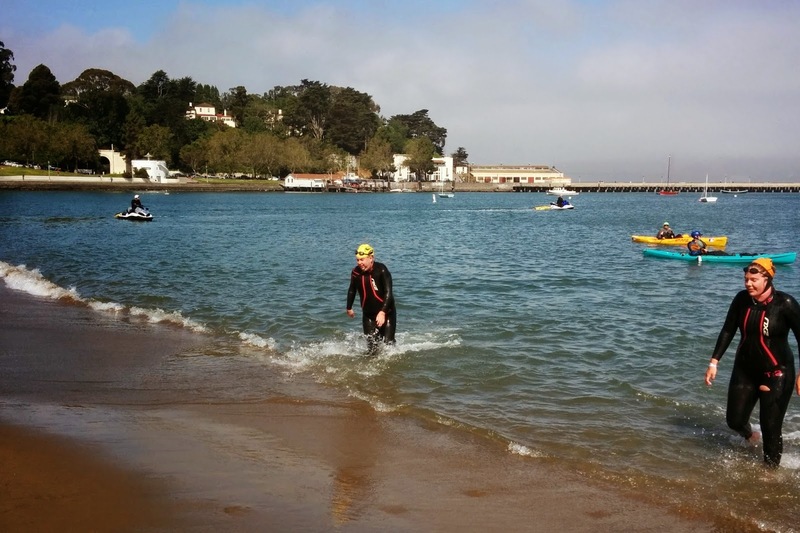 Swimming across the San Francisco Bay in 56 degree water definitely seems crazy (scary) to me. But the swimmers out there on Saturday sure seemed to enjoy the experience. I'm glad I could be a part of Mike's Alcatraz Sharkfest journey. Mike flew in from Ohio on Thursday evening, and we all headed to SF on Friday. After an amazing dinner at Tony's Pizza in North Beach on Friday night, we went to sleep early for the 5 am wake up call the next day. The swim didn't start until 8:20 am, but check in opened at 5:30 am and the swimmers had to do a race briefing and then walk to the ferry starting at 6:50 am. We left the hotel around 5:45 am, walked to the check-in area, and Mike was able to grab his shirt and timing chip before the huge line started. 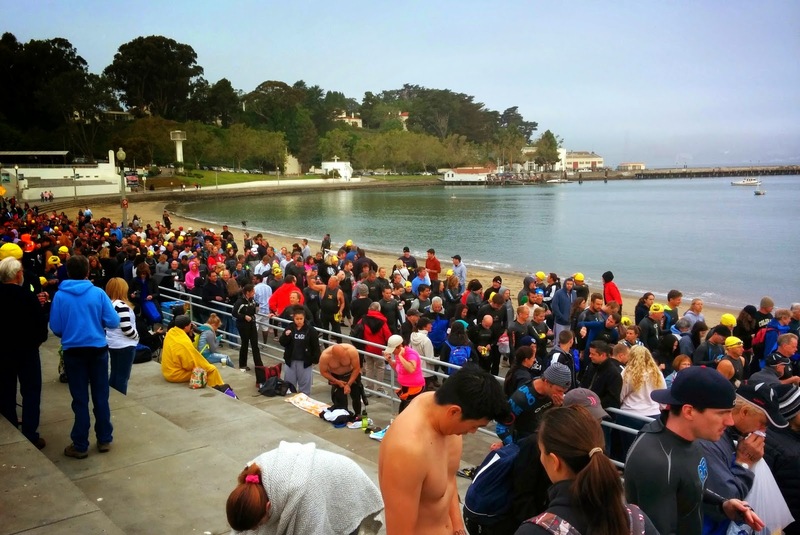 We hung out at the start area, which was the Aquatic Center near Fort Mason, until the race briefing. Kevin and I played race sherpa so Mike didn't have to worry about gear check on the ferry or leaving stuff at the finish line. Mike and Kevin before the swim. It was a very chilly morning. Shortly after the race briefing, the swimmers began the wetsuit parade down to the ferry pick-up spot. 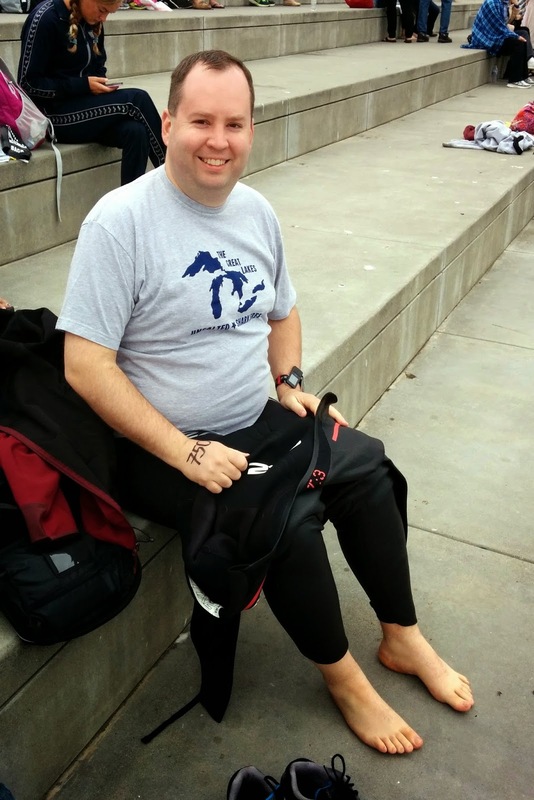 It was fun to see so many swimmers ready for their race - a very different type of race start than I've experienced. There were 900 swimmers in this event. The parade begins. When we got to the ferry pick-up, we said good bye to Mike and headed back for much needed coffee and to watch the start as best we could. It was hard to see anything with the boats looking so small, but we think we heard the start horn. The Sharkfest cap and Mike's Bia for open water swim tracking. Two ferry boats carried swimmers to the start. Kevin and I headed back to the start area for the 25 minute mark so we could see the winners come in, although this year the winners were a bit behind because the conditions were worse. Last year's winners came in around 24 minutes, this year it was a little over 30 minutes. My finish line happy tears were in full force for this one, and it was super cool to see all of the swimmers start to stream into the beach. 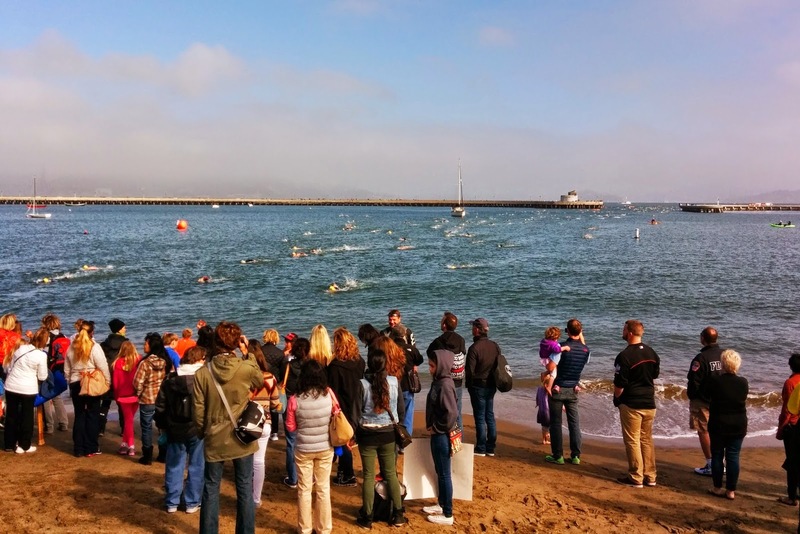 They swam across the bay from Alcatraz. Wow. Also, I want to note that there is a wetsuit AND non-wetsuit division for this race. If swimming across the cold bay isn't enough, many people did this without a wetsuit. I can't even imagine how cold that was. When it came time to expect Mike, we moved down to the beach to cheer. I was entertained that the water kept coming up farther and getting our shoes wet. 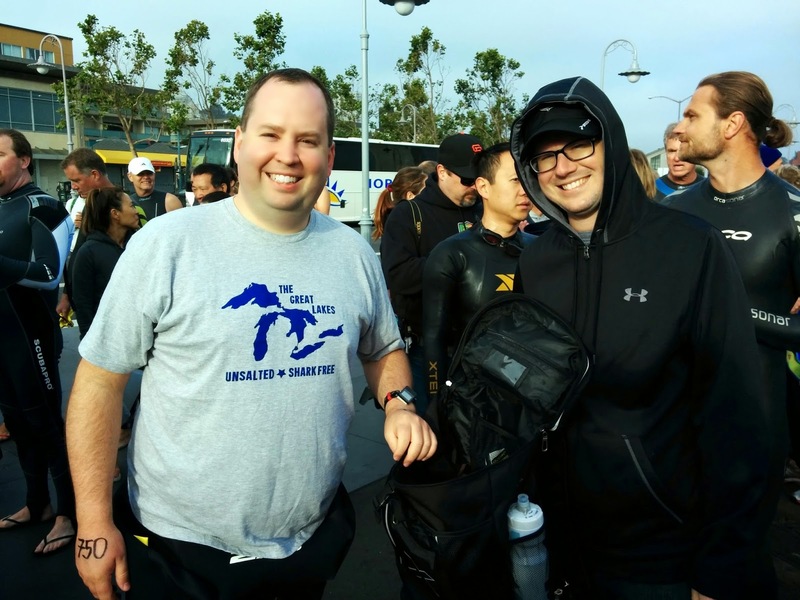 It was incredibly hard to spot a specific person with everyone wearing black wetsuits and yellow swim caps, but we managed to spot Mike before he was out of the water. I was so happy to see him emerge onto the beach; what an amazing accomplishment! I'm impressed by everyone who did this swim, and I loved watching the event. 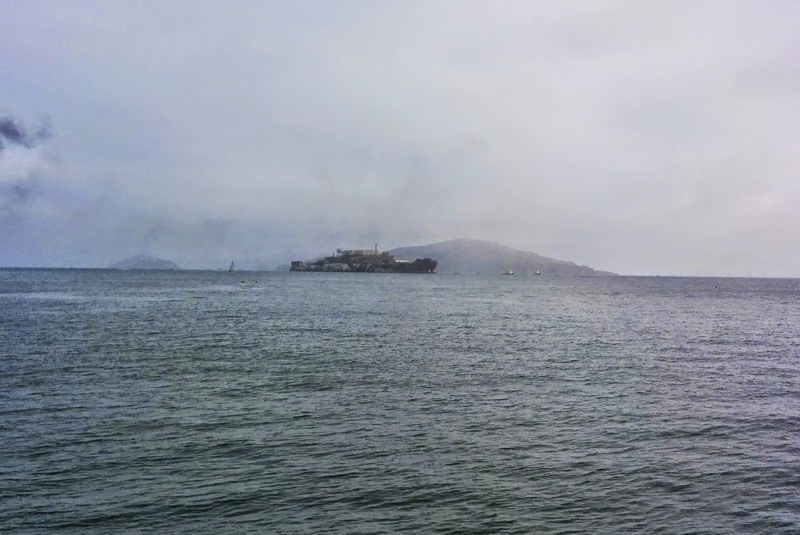 However, I can't say it made me want to swim from Alcatraz because that just seems too cold and scary. I'm in awe of everyone who did it. 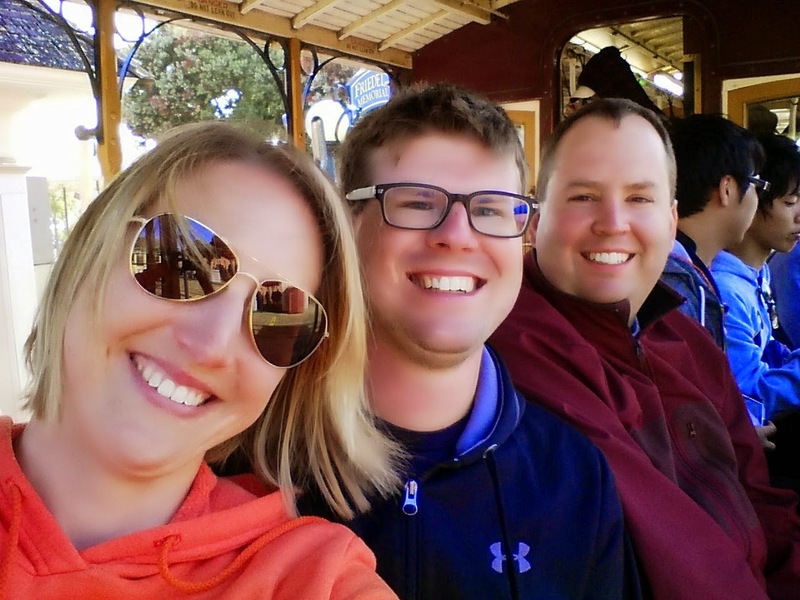 We capped off Mike's great race accomplishment with Indian food, Ghirardelli sundaes, and a ride on the cable car. 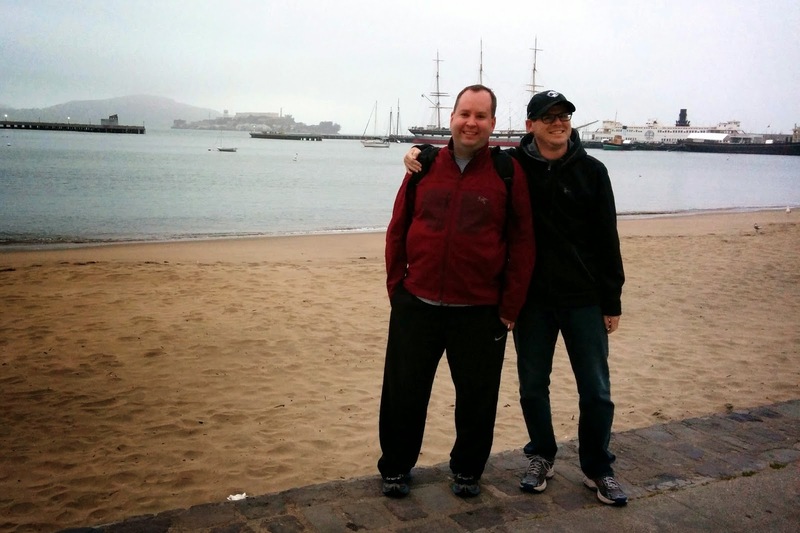 What a fun weekend in SF! Finally on the cable car...after a long line. 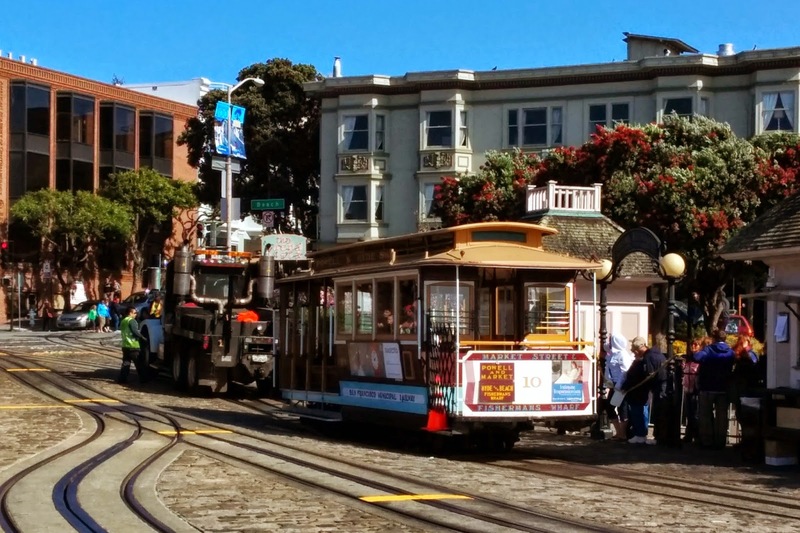 Did I mention they had to tow a broken cable car? That doesn't happen everyday. 1.5 miles, although many swimmers including Mike were pushed out by currents on this one and ended up more around 1.9. Yikes! 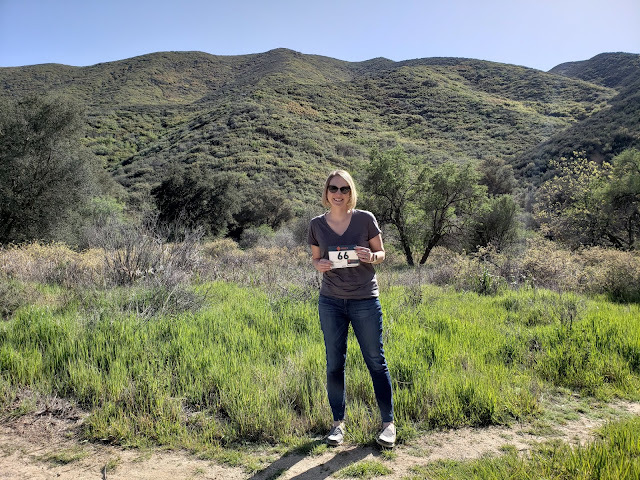 I'm feeling honored by a whole post from Paulette and Just Keep Running :) The race was supposed to be 1.5 miles, but I was with a group that was directed off course so it wound up being about 1.9 miles for me. 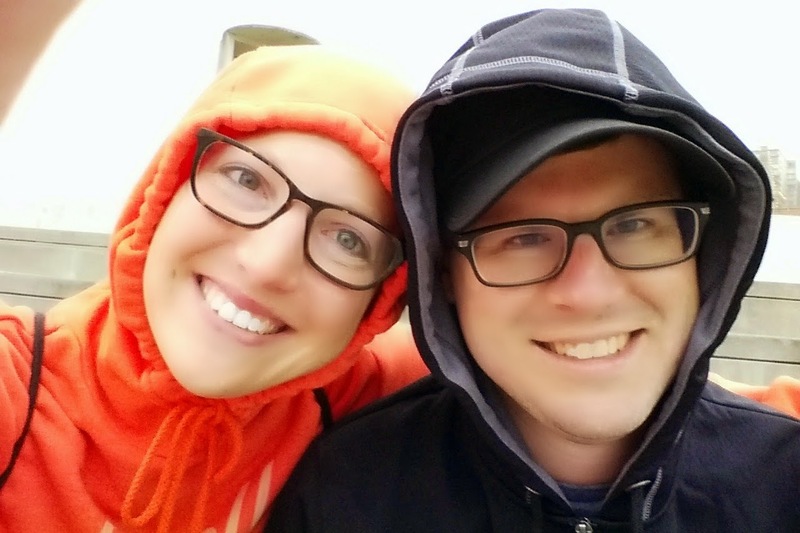 Since I suppose most of the followers here are runners, I feel just as strange at a running event as Paulette did at this event since I'm a rather natural (although slow) swimmer, and not very natural at all for running. Yeah! You are very welcome. It was really fun to see a new to me type of event! I am genuinely in awe of the nutters who do this race! Congratulations Mike, you're amazing! And crazy! That's an amazing accomplishment! I am in awe!! !